If you haven’t noticed, cold shoulder pieces have been extremely popular this year, but it can be hard to shop for the right one. Fitted clothing usually looks better on me, and many cold shoulder numbers tend to be flowy and loose, which make me feel frumpy. Even with a slight discount this particular sweater was more than I wanted to spend, but it fit so well that I decided to end the search. I also love the pink hue, which isn’t obnoxiously bright and is a nice alternative to red. 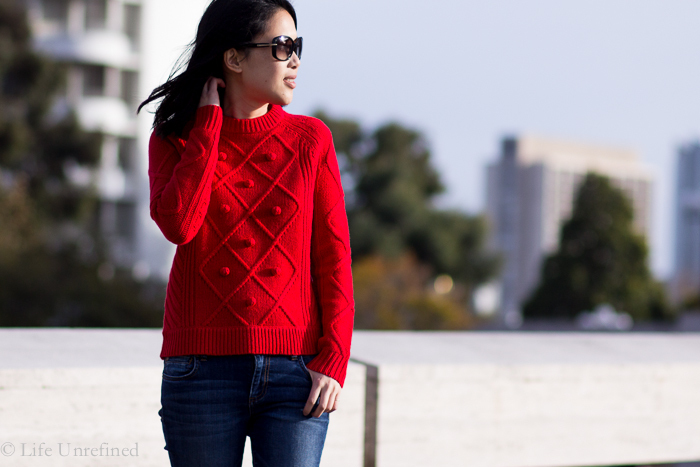 If you do like red and all things classic, you can’t go wrong with this J.Crew sweater. I saw an older lady at my church wear this exact one with a plaid shirt underneath, and she looked festive while put-together. Plus the pom pom detail gives it a playful touch, which I love. It does have a small percentage of wool, so I’ll admit it’s the slightest bit itchy, but I’ll live (you can also try layering a thin knit underneath). Note that this sweater does not come in petite sizing, so I was surprised that it fit so well on my 5’2” frame. If you’re much taller than me, it will probably have a more cropped look. 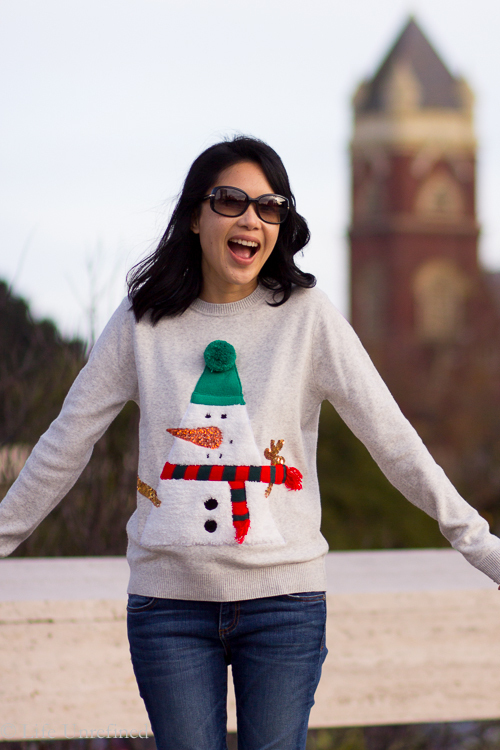 And lastly…the ugly holiday sweater! I finally got invited to an ugly sweater party this year, and I couldn’t be more excited. For years I have wanted to be invited to one, so one of my friends is making my wish come true. Ok, maybe this sweater is more cute than ugly, but cutesy is not a style I usually go for. The snowman makes me feel like I’m ten years old. And you know what? That’s the spirit of the holidays. Plus it’s a built in toy for Little V, who likes to pull at the pom pom hat, poke at the sequins, and rub her cheek on the snowman’s belly. It’s great. What’s your go-to outfit for casual holiday parties? I have always wanted to go to an ugly sweater Christmas party as well, but the hot weather in Panama didn’t allow for that. Love them all! I agree the pink one is a really great fit on you. And the snow man one is too cute! I do love a nice new sweater!